This anti-wrinkle serum contains caviar extract and organic aloe vera. It tones on the skin of the face and neck. It also contains hyaluronic acid, rose hip and collagen. 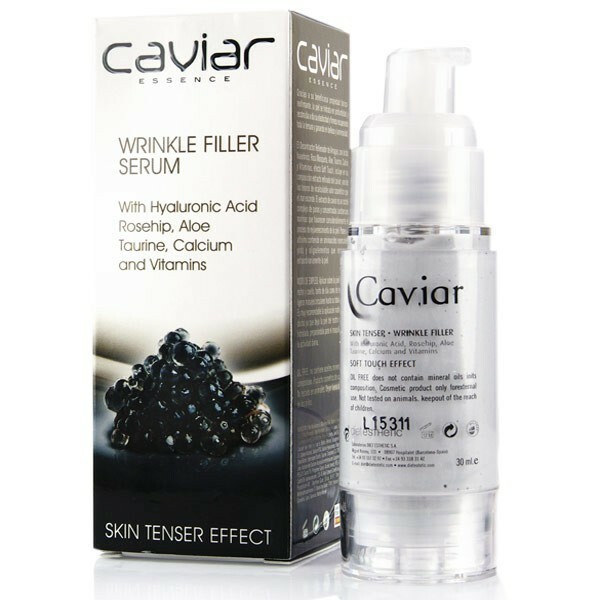 Caviar Essence Anti-Wrinkles Caviar Serum is a luxurious serum that contains several ingredients famous for their anti-aging properties. After use, all signs of aging are minimised and skin looks healthier and more youthful. The Caviar Essence Serum contains rich caviar extract that is high in amino acids and proteins, which helps to improve tone and to firm sagging skin. It also boosts collagen to give the complexion a smoothed over effect, with fresh glowing skin. Hyaluronic acid is a wonder ingredient that is found in high-end skincare, due to its incredibly hydrating properties. It allows the skin to hold more water, so it moisturizes and smooths, while filling out wrinkles. This serums also contains soothing aloe vera, which is an anti-inflammatory with additional hydrating powers. The Caviar Essence Anti-Wrinkles Caviar Serum is suitable for all skin types, including sensitive skins, as it contains no perfumes, mineral oil, or parabens.